It has often been said that Rhode Island is like one big family. Because Rhode Island is a close-knit community, there are few of us who haven’t seen a family member, neighbor, or friend touched by the growing epidemic of prescription drug abuse. According to the Rhode Island Department of Health, drug overdose is the leading cause of accidental death in our state. In fact “prescription medications are now the most commonly abused drugs among 12- to 13-year-olds because they are so easy for kids to access, often in the medicine cabinet,” according to Marcia Lee Taylor from the Partnership for Drug-Free Kids. The partnership goes on to say their “...research shows two-thirds of teens who abused pain relievers say they got them from family and friends.” Prescription drug abuse affects every community, economic class, race, and age. Simply put, it is just not an inner city problem but a statewide issue. Every year opioids abuse costs Rhode Islanders $108 million in health care costs. In fighting this epidemic, we must look at every available solution. As lawmakers, we must step up to the challenge and identify practical solutions to keep another family from the heartbreak of losing a loved one. Simultaneously, we must acknowledge that there is a legitimate use for opioid pain medications, and not block access for patients in need of pain relief due to their individual medical situations. That is why we have introduced legislation this session that helps to strike that balance by increasing access to opioid pain medicine with abuse deterrent formulations (ADFs). ADFs are manufactured in a manner that makes it difficult for them to be crushed, cooked or altered —which is what drug addicts do to these pills in order to snort or inject them for an immediate high. In a recent hearing, it was demonstrated just how different these new medications are—in some cases, that they are nearly unbreakable. Despite efforts with a hammer, the ADF pills could not be crushed, in contrast to the traditional medications that smash easily and are therefore easily abused. It was not difficult to see why someone looking to alter medications for a high would have difficulty achieving this with ADF pills. Simply put, ADF medications have the ability to stop addicts from their abusive methods. The opioid market is flooded with cheap, non-abuse-deterrent opioids. Only two-percent of prescribed opioids have any abuse-deterrence. And every day, hundreds of prescriptions for abuse-deterrent formulations are being switched for the non-abuse-deterrent. We have to do better and this legislation enables us to do just that. Our legislation would ensure that patients get the medicine that their doctors prescribe. Our legislation also guarantees insurance parity to ADF medications, so that no additional out of pocket costs would be required by those patients who need them to manage their chronic pain. This would mean that doctors won’t have to take a patient’s financial situation into account when prescribing pain medication. Rather, the most appropriate and safe medication can be given, based on the doctor’s medical opinion. The FDA continues to approve more and more of these safer medications and ADF medications will become more accessible for consumers, but only if we can keep the doctor/patient relationship primary in care delivery. We have introduced House bill 5219 and Senate bill 167 to make certain that Rhode Islanders benefit from this advancement in medicine formulation. We want to make sure that ADFs are available and affordable to patients for their treatment and care and to make it clear that we have to take every precaution to minimize this problem of prescription opioid abuse. We would be naïve to think that this problem has one solution. In talking to counselors and drug treatment experts in our state who deal with substance abuse issues every day, we know that the issue of prescription drug addiction is multi-faceted. As a community, we need to put every available option on the table to start to chip away at the problem. We urge our fellow lawmakers to join us in supporting this legislation and take one step forward in curbing the prescription. Thursday night, the RI House Judiciary Committee heard testimony on two pieces of gun legislation, H5861, which would close the loophole allowing concealed-carry permit holders to carry on school premises, and H5190, which would make permit renewal automatic without any requirement for requalification. Both measures were "held for further study," which is usually the way bills are quietly killed. I’m John McDaid, from Portsmouth, and I’m here as a parent and a member of the Humanists of Rhode Island to support bill H5861 and oppose H5190. Here’s my nightmare. Imagine you’re picking up your kid at school. As you get buzzed in by the office, a guy standing in the lobby with you holds open the door for you. His jacket opens slightly and you see the distinctive slide of a Glock G42, what the NRA’s magazine calls an “an easy-to-carry, close-range defensive tool,” tucked into his waistband. He notices your gaze and says, “Don’t worry, I’ve got a permit.” What could you do or say? Right now, in Rhode Island, the answer is “nothing.” You can ask him, “Are you a good guy with a gun or a bad guy with a gun?” You can see if he reminds you of Adam Lanza or Seung-Hui Cho, but in those tenths of a second you have to make a decision, how do you tell a friendly neighbor from a sociopath? You’re standing there, and a guy with a gun is about to enter your child’s school. What do you do? Fortunately, the General Assembly, in its wisdom, understood the challenges of this situation when they wisely crafted 11-47-60 to ban concealed weapons on school grounds. All H5861 would do is reconcile the language of this existing legislation with the possibly conflicting language in 11-47-9 and 11-47-18. There are two reasons I feel concealed carry is a problem on school property. First, the mere presence of a loaded weapon creates the possibility for potentially fatal accidents and incidents. According to the CDC, in 2013, the last year for which data is available, there were 16,864 reportable unintentional gunshot injuries. That’s 46 firearm accidents every day. To pick a recent data point: just this Easter Sunday, a man in Altoona, PA shot himself in the leg during Mass when the trigger of his pistol caught in his pocket. Concealed weapons present a constant unmitigateable risk of unintended discharge. If this were to take place in a classroom, the results could be catastrophic. And the possibility of a child — either innocently or maliciously — using an improperly secured weapon is equally grim. These are unforced errors that can be avoided by maintaining gun-free schools. My wife lost her 12-year-old cousin in a shooting accident — a couple of innocent kids looking at guns in a friend’s house. When our son was younger, we were reluctant to have him play at a friend’s house where we knew there were guns, because kids are curious and accidents do happen. Without H5861, parents are forced to send their children into a school environment with the same potential dangers. Second, relying on permit holders be able to protect students and staff in a school shooting situation is, to put it bluntly, delusional. To get a concealed carry permit in Rhode Island, applicants only need to demonstrate minimum accuracy on a range (putting 30 rounds in a 14-inch target at 25 yards) every four years (It should go without saying that reducing the qualification requirement, as H5190 does, is a step in the wrong direction). There is no requirement that a permit holder have training in decision-making, real-world tactical scenarios, or even drawing from concealment. Nor, more to the point, how to de-escalate dangerous situations. In short, there is no evidence that permit holders would have *any* of the requisite training to deal with the complex, high-stress situation of an active shooter. Attached is a link to a video done by ABC News showing how average armed citizens were able to respond in a simulated school shooting situation. Spoiler: they all would have died. If the General Assembly wants to do something to address school safety in crisis situations, I’d encourage you to investigate the ALICE program being used in Massachusetts and some Rhode Island communities. More guns is not the answer. I respectfully urge the committee to close this loophole and support H5861. Thank you for your consideration. 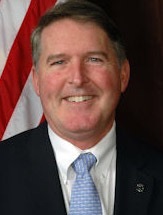 Rep. Jay Edwards (D-70, Portsmouth) has submitted bills in the RI General Assembly that would prohibit unauthorized highway surveillance and create a committee to review and recommend laws for repeal, according to a state house release Friday. Rep. Edwards bill (2015-H 5051) would prohibit surveillance on any public highway in Rhode Island unless specifically authorized by statute or court order. The bill would also provide for the confidentiality of information collected or stored. All information collected through acceptable forms of surveillance under the law would not be subject to the Access to Public Records Act (APRA) or Freedom of Information Act (FOIA) without a court order. Employees of the state would be able to access this information for customer service, statistical, administrative, or legal purposes, as long as it is justified as necessary to performing their duties. Additionally, no information or data would be stored for more than five years unless a court orders otherwise. Rep. Edwards’ bill (2015-H 5054) would create the Joint Committee of the Repealer, which would effectively compile suggestions for the repeal of statutes, regulations and executive orders received from citizens, businesses and government agencies. The committee would consist of six members, three from the House and three from the Senate. Following a review of the suggestions, the committee would then make its recommendations to the General Assembly of laws to repeal or to the governor of executive orders to repeal. Both bills were forwarded to the House Judiciary Committee; based on information on the General Assembly web site, both were heard on Tuesday, Jan 20, and are being held for further study. Portsmouth Rep. Ray Gallison (D-69) has been reappointed as chair of the House Finance Committee by House Speaker Nick Mattiello, according to a state house news release distributed today. Representative Gallison was first appointed to the position in March 2014, when Speaker Mattiello was elected to his post. At the time, Rep. Gallison had been serving as co-vice chairman since 2010 and the committee was in the midst of deliberations on the 2015 budget bill. In a matter of 12 weeks, the committee completed its work on the $8.7 billion state budget, closing an unexpected $67 million gap, fully funding education aid, averting bridge tolls and tax increases, establishing a steady source for transportation funding, and promoting economic development while reducing the corporate tax rate and the inheritance tax. The Finance Committee is considered the most influential of the House committees, since it is in charge of developing the state budget as well as other matters that have a financial impact on the state. It is also one of the busiest committees, meeting daily for much of the session. Rep. Gallison was first elected to the House of Representatives in 2000. He served on the committee from 2003 to 2006, and then again from February 2010 to the present. From 2011 until his appointment as chair of Finance, he was chair of the House Veterans’ Affairs Committee. He also previously served as vice chair of the Environment and Natural Resources Committee and as a member of the Health, Education and Welfare Committee, the Judiciary Committee and the former House Separation of Powers Committee. He was a deputy majority leader for three terms as well. A self-employed attorney practicing in Massachusetts, Rep. Gallison lives in Bristol. He and his wife, Diane, have two sons, Timothy and Nathan. He earned his law degree from what is now the University of Massachusetts Dartmouth School of Law, and completed his undergraduate studies at Rhode Island College. He is a La Salle Academy graduate. Portsmouth Rep. Dennis M. Canario (D-71) received committee assignments for the 2015-16 legislative session, picking up one additional committee, according to state house news release. Rep. Canario, who is serving his second term in the House, will continue to hold the position of Deputy Majority Leader. Rep. Canario will continue to serve on the House Committee on Judiciary, and will also continue to serve as the Secretary of the House Committee on Health, Education and Welfare as he did during the 2014 General Assembly session. This term, Canario has also been appointed to the House Committee on Veterans’ Affairs. Committee appointments were announced this week by Speaker of the House of Representatives Nick Mattiello. The Committee on Judiciary is one of the major standing committees of the House and is responsible for all bills affecting the penal code, judicial system, ethics, open meetings, access to public records and election law. The Committee on Veterans’ Affairs hears legislation that impacts the lives of Rhode Island veterans. Two of Portsmouth's state representatives — Dennis Canario (D-71) and Jay Edwards (D-70) announced their intention to press the RI Public Utilities Commission to reject a proposal by National Grid to hike electricity rates by nearly 24% next year. In a joint statement this afternoon, the two reps expressed concern for the effect of the increase on both homeowners and commercial customers. National Grid filed its request for a 23.6 percent rate hike with the PUC earlier this week, saying the commodity price spike it is seeing is due, in part, to lack of capacity in pipelines bringing natural gas to New England. When there is insufficient capacity to move more natural gas to the region, the price to use the pipes gets higher. Reps Canario and Edwards said they understand the pressure on National Grid to maintain service to their customers in the face of rising commodity prices. But with the colder months rapidly approaching, consumers are already expecting to see higher utility bills as they try to keep their homes warm. A hike of this size, they said, is excessive. 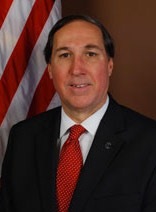 Rep. Dennis Canario (D-Dist. 71, Portsmouth, Little Compton, Tiverton), center, is joined by Rep. John G. Edwards (D-Dist. 70, Tiverton, Portsmouth), right, during presentation of a $2,000 legislative grant to the Tiverton Education Foundation. Accepting the check on behalf of the organization are, from left, Deborah Pallasch, Diane Saana and Linda Larsen. The Tiverton Education Foundation raises money through donations, grants and fundraisers to be used for unbudgeted or enrichment programs within the Tiverton schools to help stimulate students’ academic achievements and enrich their learning environment. As many of you know, my first term serving in the House of Representatives (District 71) and the People of the State of Rhode Island was not only a historic one for our state, but a very meaningful one for our community. Removing the tolls on the Sakonnet River Bridge and funding our state’s road and bridge infrastructure system was a vital step in helping save our economy in both East Bay and our state. I am proud of the tremendous work we accomplished and I know there is still a lot more to do. Jobs and the economy are two very important issues that we must continue to work at. I have and will continue to advocate for a clean/green environment, address how we tax retirement income, sensible and responsible spending of taxpayer money, equal civil rights for all Rhode Islanders, and support the health and welfare of all veterans and those with special needs. I am honored to announce that I will seek re-election for State Representative to the General Assembly representing district 71 which covers portions of Portsmouth, Tiverton and Little Compton. As your State Representative I have worked tirelessly for our district and have made great strides. I ask each and every citizen for your support and I ask that you allow me to continue to build on a better future for Rhode Island. My proven record of commitment, honesty and integrity will help keep us on that path to a brighter future. Portsmouth Rep. Dennis Canario has been appointed a Deputy Majority Leader of the Rhode Island House of Representatives. The appointment was announced this week by Speaker of the House Nick Mattiello. As a Deputy Majority Leader, Canario is a member of the House leadership team and will work closely with the Majority Leader and Senior Deputy Majority Leader to ensure that party members are properly informed on measures and votes coming before the body. 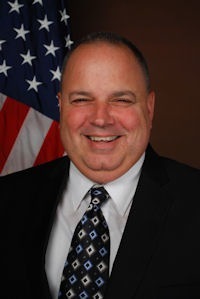 In addition to that post, Rep. Canario has been named the Secretary of the House Committee on Health, Education and Welfare and will continue to serve as a member of the House Committee on Judiciary. 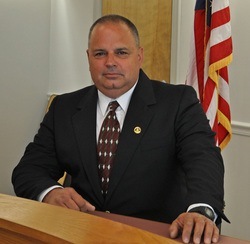 Rep. Canario, who is serving his first term in the House of Representatives, is a retired police officer who served on the Portsmouth Town Council for six years, including two years as president. With this announcement, three of Portsmouth's reps have been appointed to leadership positions in the House. In addition to Canario, Jay Edwards (D-70) is Majority Whip, and Ray Gallison (D-69) is chair of the House Finance Committee. With the support of Speaker of the House Nick Mattiello (D-15, Cranston) and his colleagues in Tuesday’s Democratic caucus, Rep. Jay Edwards (D-70) has secured a new title: House majority whip. He will join a new slate of lawmakers who have been cemented as part of the speaker’s leadership panel, including Rep. John DeSimone (D-5, Providence) as majority leader and Rep. Joseph Almeida (D-12, Providence) as deputy majority whip. Majority Whip Edwards, 55, has been an active opponent of tolls on the Sakonnet River Bridge and has introduced legislation this year to create a predictable statewide funding source for roads and bridges without the toll. He has been a strong advocate for government transparency, tenants’ rights, and cracking down on industrial polluters, among other issues. He was also the lead sponsor for the 2012 bill that decriminalized the possession of small amounts of marijuana. Prior to his 2008 victory in the District 70 race, Representative Edwards served on the Tiverton Town Council. Since he became a state representative, he has served on the Labor, Small Business and Veterans’ Affairs committees. He is a 1983 graduate of Northeastern University, graduated from St. George’s School in 1976, and is a 1975 graduate of Le Centre Scholaire St. Marc in Lyon, France. He and his wife, Donna, have three children: John, Kelsey and Mae. A project manager for the construction firm H.V. Collins Company, he is past chairman of Associated Builders and Contractors Rhode Island, and has been active in the Tiverton Land Trust, Friends of the Tiverton Library, Caritas RI, the Tiverton Lions Club, the Ancient Order of the Hibernians, the National Eagle Scout Association, Save the Bay and Clean Water Action.